Note: The work was commissioned directly from the artist by the Stedelijk Museum, Amsterdam, The Netherlands, 1990 for the exhibition Energieën. Beacon (Two Versions of the Imaginary) consists of an aluminum cylinder, measuring 54 long x 6 diameter inches (137 x 15.24 cm.) and equipped with a 4-inch black-and-white monitor and projection lens at either end, that is suspended from the ceiling and rotates approximately one revolution per six minutes. Images are projected out the ends of the cylinder onto the four walls of the space. Standing figures are seemingly revealed by the “beacon,” as if the revolving light illuminated them in the darkness; alternating exchanges by a man and a woman read excerpts from Maurice Blanchot’s essays “Essential Solitude” and “Two Versions of the Imaginary.” At one point images of a mother and her child gaze across the space, their faces reflective with fascination. The series of projected images ends with images of a stream, in which water flows towards the viewer (i.e., as if into the beam) in one projection and away from the viewer (as if out of the beam) in the other. 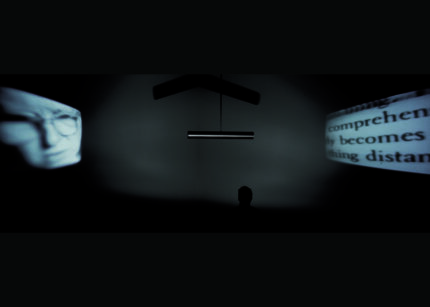 The projections continually change their shape and clarity from sharp to completely unfocused. Only when the cylinder projects perpendicularly onto the facing walls do the images have a rectangular form. Otherwise, ever-changing trapezoidal forms grow and contract, at times seemingly floating off the walls. It is never possible to view two images at once, because the light coming from the ends of the cylinder is aimed in opposite directions. 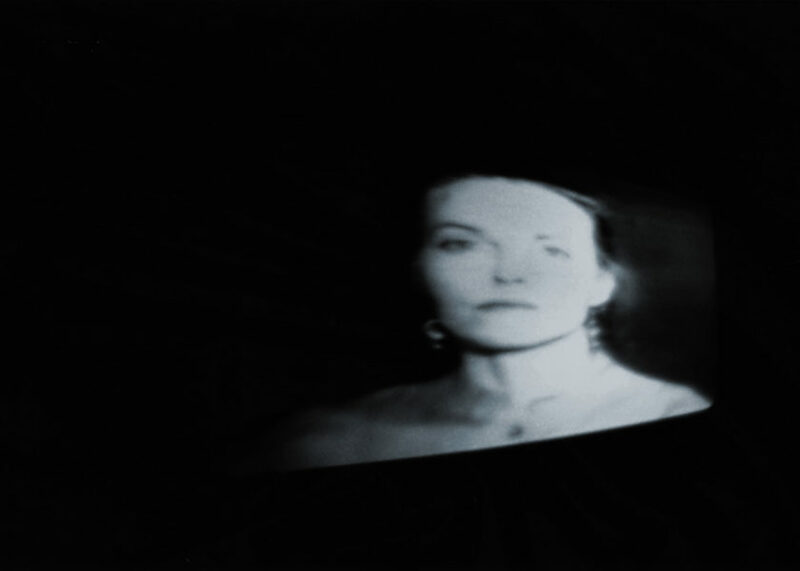 An example of this work was first exhibited at the Stedelijk Museum, Amsterdam, The Netherlands, from April 7 – July 29, 1990 as part of the exhibition "Energieën (1990 – Energies: An Exhibition of Fifteen International Artists)." “Bienal de la imagen en movimento ’90,” Centro de Arte Reina Sofia, Madrid, Spain, December 12 – 23, 1990. “Gary Hill,” (travelling exhibition organized by the Henry Art Gallery, University of Washington, Seattle, Washington), Hirshhorn Museum and Sculpture Garden, Washington, D.C., February 17 – May 8, 1994; Henry Art Gallery, University of Washington, Seattle, Washington, June 10 – August 14, 1994; Museum of Contemporary, Los Angeles, California, December 19, 1994 – March 12, 1995; Guggenheim Museum SoHo, New York, New York, May 11 – August 20, 1995; Kemper Museum of Contemporary Art, Kansas City, Missouri, October 14, 1995 – January 14, 1996. 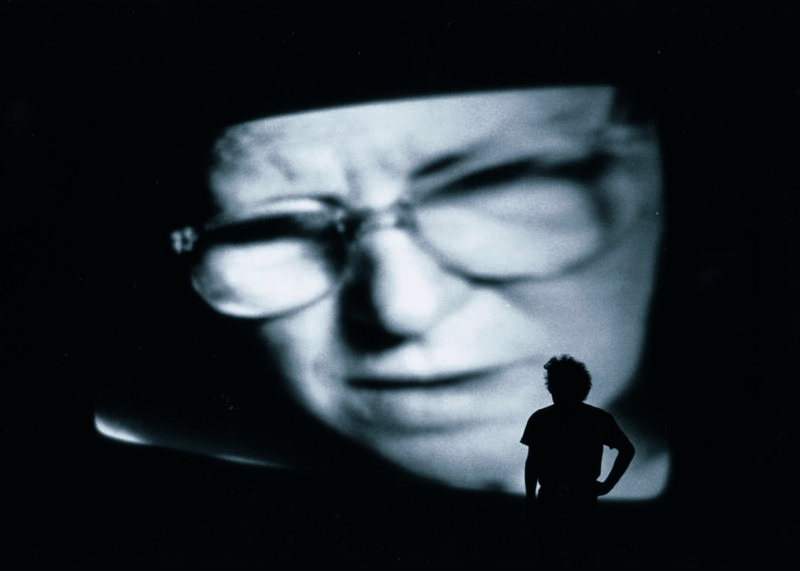 “Gary Hill,” (travelling exhibition organized by Riksutställningar, Stockholm, Sweden), Moderna Museet, Spårvagnshallarna, Stockholm, Sweden, February 4 – April 17, 1995. Hill, Gary. "BEACON (Two Versions of the Imaginary)," ENERGIEEN Amsterdam: Stedelijk Museum, 1990. Reprinted in the catalogue, Bienal de la Imagen en Movimiento '90 Madrid: Museo Nacional Centro de Arte Reina Sofia, 1990, pp. 180 – 183. Van Assche, Christine. “Video Story.” Galeries Magazine 38 (August/September 1990), p. 68. Viñuela, Ana. “La convergencia de los soportes. I Bienal de la Imagen en Movimento Centro de Arte Reina Sofía.” Cinevideo, Spain (1990), p. 5. Van Assche, Christine. "Gary Hill: The Imager of Disaster. Interview with Gary Hill" Galeries Magazine (December 1990/January 1991), p. 140. 1991 Biennial Exhibition. New York: Whitney Museum of American Art, 1991, pp. 104, 105. Valiente, Pablo. "Primera Bienal De La Imagen En Movimiento." RTV Magazine di los Mercados Audiovisuales 20 (January 1991), pp. 63, 64. Lageira, Jacinto. "Gary Hill. Une verbalisation du regard." Parachute 62 (April/May/June 1991), cover. Watari, Shizuko. Gary Hill –I Believe It Is an Image. Tokyo: WATARI-UM, The Watari Museum of Contemporary Art, 1992, unpaginated. Cooke, Lynne, Bice Curiger and Greg Hilty. DOUBLETAKE: Collective Memory and Current Art. London: Hayward Gallery, 1992, pp. 156, 157, 213. Sarrazin, Stephen. Chimaera Monographe No. 10 (Gary Hill). Montbéliard, France: Centre International de Création Vidéo Montbéliard, Belfort, 1992, pp. 44, 59, 82. (Including an excerpt from an interview with Gary Hill). Mignot, Dorine. Gary Hill. Amsterdam: Stedelijk Museum; Vienna: Kunsthalle Wien, 1993, pp. 6, 8, 9, 11, 16, 80 – 89, 112. (Including an excerpt from Gary Hill, “Inter-view”). Van Assche, Christine and Corinne Diserens. Gary Hill. Valencia: Instituto Valenciano de Arte Moderno (IVAM), Centre del Carme, 1993, pp. 16, 26, 27, 110 – 116, 130, 131, 145. (Including an excerpt from Gary Hill, “Inter-view”). Von Graevenitz, Antje. "Living Funeral Art--Video Installations by Bill Viola and Gary Hill." Archis (July 1993), p. 47, 53. Den Hartog Jager, Hans. “Droomwereld.” HP de Tijd (September 3, 1993), pp. 113, 114. Perrée, Rob. “Gary Hill: Kijken, Horen, Lezen.” Kunstbeeld (September 1993), p. 14. Cornwell, Regina. “Gary Hill Interview.” Art Monthly 170 (October 1993), pp. 5 – 9. De Rijcke, Elke. “Dageraad of avondschemer over de video-installaties van Gary Hill.” Metropolis M 1 (1993), pp. 26 – 29. Múltiplas Dimensões/Multiple dimensions. 2 volumes. Lisbon: Centro de Cultural de Bélem, 1994, vol. 1: pp. 39, 87. “BEACON (two versions of the imaginary).” Sculpture, Washington, D. C. 13 (July/August 1994), p. 33. Nagy, Pál. Az irodalom úm mufajai. Budapest: Magyar Muhely, 1995, pp. 350, 351. Duncan, Michael. “In Plato’s electronic cave.” Art in America 83, 6 (June 1995), pp. 72, 73. Beckmann, Angelika. “Gary Hill.” European Photography 58, 16, 2 (Fall 1995), pp. 63, 67. Quasha, George and Charles Stein. Tall Ships. Gary Hill’s Projective Installations 2. Barrytown, New York: Station Hill Arts, 1997, pp. 7, 45 – 47, 51, 54. Petho, Bertalan. post-postmodernism: The Nineties: Opinions and Philosophical Investigations Concerning Our Change of Era. Budapest: Platon, 1997, p. vi. Bélisle, Josée. Gary Hill. Montreal: Musée d’art contemporain de Montréal, 1998, pp. 12, 16, 17. Stals, José Lebrero. Gary Hill: HanD HearD – Withershins – Midnight Crossing. Barcelona: Museu d’Art Contemporani de Barcelona, 1998, p. 12. Der elektronische Raum: 15 Positionen zur Medienkunst. Bonn: Kunst- und Ausstellungshalle der Bundesrepublik Dueuschland, 1998, p. 152. Kold, Anders, ed. Gary Hill. Aarhus: Aarhus Kunstmuseum, 1999, pp. 42 – 47. Kunstmuseum Wolfsburg Gesammelte Werke 1 Zeitgenössische Kunst seit 1968. Wolfsburg: Kunstmuseum Wolfsburg, 1999, pp. 220, 221, 224, 225. Morgan, Robert C., ed. Gary Hill. Baltimore: PAJ Books / The Johns Hopkins University Press, 2000, pp. 87, 221, 227 – 229, 232, 287 – 289, 296. Gary Hill en Argentina: textos, ensayos, dialogos. Buenos Aires: Centro Cultural Recoleta, 2000, pp. 14, 43. Gary Hill: Instalaciones. Córdoba: Ediciones Museo Caraffa, 2000, pp. 16, 22, 54. Lageira, Jacinto. Des premiers mots aux derniers silences in Gary Hill: Around & About: A Performative View. 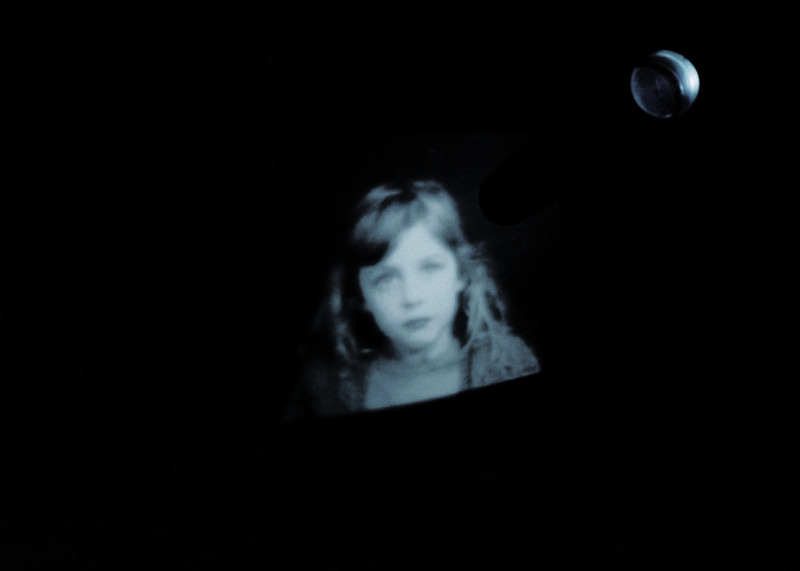 Paris: Éditions du Regard, 2001, pp. 14. Quasha, George and Charles Stein. La performance elle-même in Gary Hill: Around & About: A Performative View. Paris: Éditions du Regard, 2001, p. 79. Gary Hill: Selected Works and catalogue raisonné. Wolfsburg: Kunstmuseum Wolfsburg, 2002, GHCR 63, pp. 24, 37, 143 – 146, 179. Shaw, Jeffrey and Peter Weibel. Future Cinema: The Cinematic Imaginary after Film. Karlsruhe: ZKM and Cambridge: MIT Press, 2003, pp. 307. Odin, Paul-Emmanuel. L’absence de livre [Gary Hill et Maurice Blanchot – Écriture, vidéo]. Marseille: La Compagnie, 2007, pp. 131, 157, 185 – 191, 187, 190, 203, 266, 286, 294, 297. Quasha, George and Charles Stein. An Art of Limina: Gary Hill’s Works and Writings. Barcelona: Ediciones Polígrafa, 2009, pp. 540 – 541, 569.